Eddie Trunk might not be as well known in the UK as he is in his native USA, but serious rock fans will have probably heard of him. He is one of America's most popular rock/metal broadcasters and journalists, and has covered rock for over two decades now. 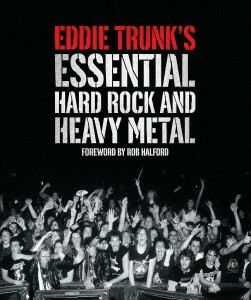 Since 2001 he has hosted VH-1's 'That Metal Show', which has made him very popular with metal's elite, hence Rob Halford's foreword to this book. This lavishly produced full colour book is very nicely presented and covers Trunk's favourite rock and metal bands, including Motley Crue, Queen, Rainbow, Kiss, Black Sabbath, Bon Jovi, Metallica and Guns 'N Roses. He gives a potted history of each band and offers some personal anecdotes, and there are lots of cool photographs, including some of Trunk with his favourite artists. It's a bit of an ego trip but Trunk is very entertaining. Trunk has turned a lot of young impressionable teens on to certain bands just as some rock journalists in this country have done and continue to do, which is why bands need enthusiastic journalists/fans like Eddie Trunk. It's obvious Trunk loves his rock music; there's no question about it. You can feel his enthusiasm for rock on every page. It's not a deeply factual book as most reference books usually are, and it's certainly not as dry as most. It's more of a memoir and for that it's all the more entertaining.